Most companies would yearn for what may be Apple’s worst quarterly report since it launched the iPhone in 2007. Sure, the $550 billion tech giant’s top line nearly flatlined as demand for its smartphones stalled in the last quarter of 2015, but sales did edge higher than a year earlier despite the dollar’s strength, the gross margin topped 40 percent and profit hit a record $18.4 billion. Even so, Chief Executive Tim Cook may be in for a dose of model-cycle purgatory. The company’s latest 6S phone models are only slightly better than the version they superseded. That’s one reason for less dramatic sales growth than in the past. Apple says iPhone sales will actually shrink in the current quarter – the first time that has happened. That will hurt, as the handsets represented more than 65 percent of the company’s $76 billion of sales last quarter and a greater chunk of profit. Apple should roll out a new phone, with more dramatic improvements, in the autumn, if history is a guide. That leaves a while for Apple investors to fret over the possibility the company has lost its edge – or, perhaps even worse, that the smartphone market really is close to saturation. After all, sales only grew 10 percent last year, according to consultancy IDC. The day will eventually come, but several things indicate Apple’s problem isn’t a saturated market. That tends to provoke ferocious competition, but there’s no sign Apple is feeling the need to slash prices. Its sales in China increased 14 percent in the quarter from a year before, despite the Middle Kingdom’s economic deceleration. India and Africa remain relatively untapped. And for all the attention, iPhones are not Apple’s only product. For the next few quarters, however, Apple’s gadgets look relatively unexciting, and sales growth will suffer accordingly. Investors can shrug off this pain, as the company’s $216 billion cash hoard means there is plenty of room to increase buybacks and dividends. Moreover, the company only trades at about 10 times estimated earnings, even including all that cash – about a third below the typical S&P 500 Index company. That’s an excessive discount, even for a juggernaut that may be slowing down. Apple on Jan. 26 reported revenue of $75.9 billion for its first fiscal quarter to Dec. 26, an increase of 2 percent from the same period in 2014. The company earned $18.4 billion, or $3.28 per diluted share, compared to $18 billion, or $3.06 per share, in the same quarter a year earlier. 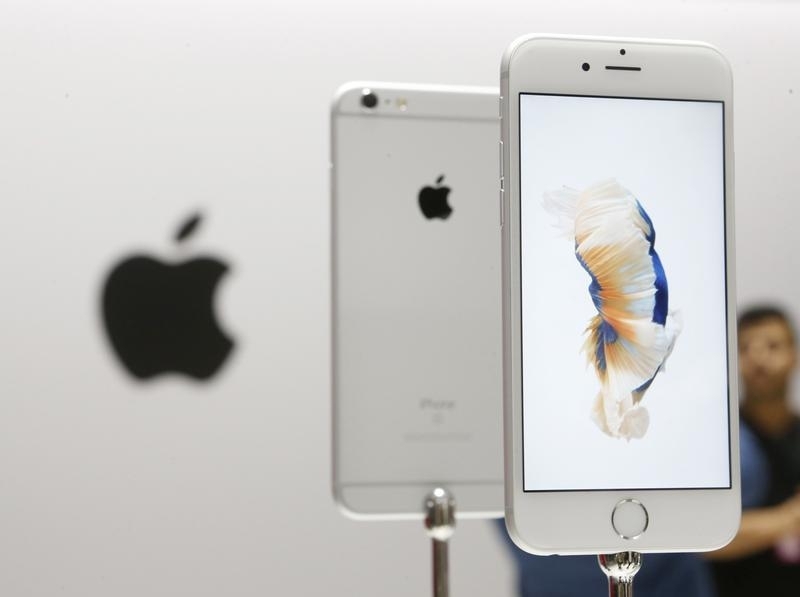 Apple sold 74.8 million iPhones in the quarter, compared to 74.5 million in the same period in 2014. The number of iPads sold fell 25 percent to 16.1 million and the number of Mac computers sold decreased 4 percent to 5.3 million.